Over the past month I have had several occasions to drive through rural Illinois. These trips through the Land of Lincoln are pretty rare for me. 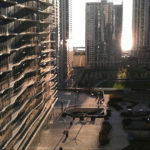 Chicago seems to have a gravitational pull of its own. Even traveling to the satellite suburbs is a tough sell to anyone living downtown. As cosmopolitan as Chicago is, downstate Illinois is proportionately rural. About half an hour out of town the view on any highway heading south or west turns to cornfield. Hour after hour the fields and farmhouses repeat like the chase seen of a Tom and Jerry cartoon – window, lamp, table, window, lamp, table, etc. Despite the monotony, city slickers can view the landscape with a degree of romanticism. I likewise recall my childhood on a farm in rural Michigan and begin to wonder if I ought to leave the city and return to my roots. Like most people, my interest in small town life is predicated upon a slower pace, lower cost of living, and having more time to devote to my interests. Having to commute long distances into the city would completely scratch each of those ideals. So the question is, are there jobs in small towns? For a time, industry moved to rural communities presumably to take advantage of lower costs. On recent work assignment in Danville, Illinois, I visited a Quaker Oats factory. The processing equipment is housed within an old concrete building still adequate for supporting the heavy machinery needed for making healthy breakfast foods. The health of Danville’s industry is due to the city’s fortunate geographic location between major population centers. By my observations driving through rural Illinois, small towns that have held onto manufacturing are the exception. Population decline, which must be related to shuddering industry, further leads to the sense of emptiness I feel when driving by. Back in 1990, the New York Times reported that there had been a 50% decline in small town population since 1950. Without customers downtown shops must close their doors. 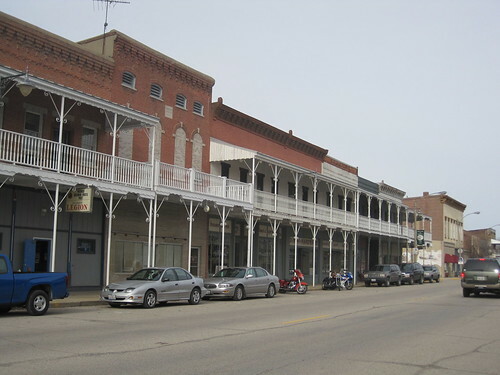 Greenup, Illinois provides an example of the decline of the classic main street USA. The town is visually recognizable by the unique overhanging porches that line the main street. It reminds me a little of the balconies in New Orleans’ French Quarter. 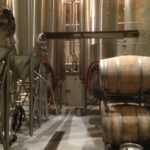 Unfortunately, many of the business below have closed in recent years, and the porches are in need of quite a bit of maintenance. However, you can still get a glimpse of what the town’s atmosphere would have been like in its heyday by visiting the Candy Kitchen ice cream shop on Cumberland St. 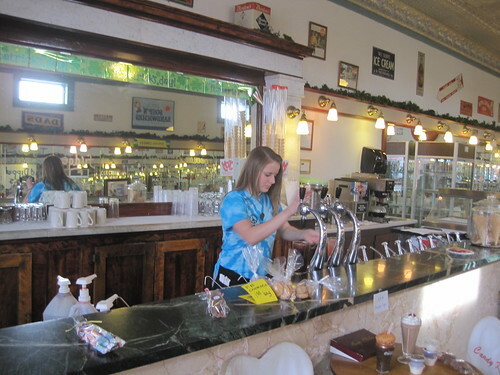 The interior is still decorated like a classic soda fountain shoppe, and the ice cream is probably the best in the Midwest. Some towns manage to survive tough times by offering unique tourist attractions. 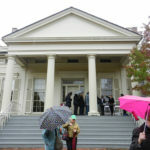 New Harmony, Indiana has built upon a rich history of utopian settlement to form a rural Mecca of art and architecture. The town was founded in 1814 by a religious group known as Harmonists – the second of three failed utopian communities pioneered by George Rapp. Later, the town was purchased by Robert Owen, who again envisioned a more perfect society. 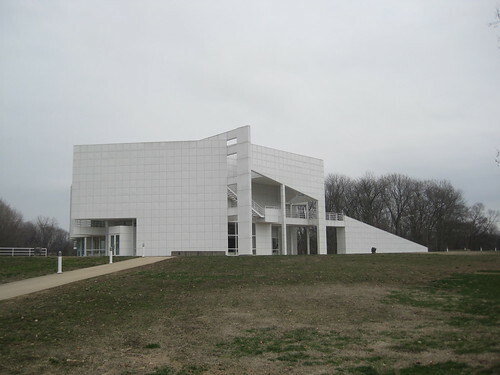 More recently, New Harmony has sponsored substantial works by famous artists and architects, including: Richard Meier’s Athenaeum, Philip Johnson’s Roofless Church, a memorial to Paul Johannes Tillich by James Rosati, and a replica of the Chartres Cathedral labyrinth. I was invited to the town to present some work on a gateway for the city envisioned by John David Mooney. Mr. Mooney’s vision seeks to further solidify New Harmony’s national significance by artistically combining solar power generation with agriculture, a sense of community, and education. It’s an intriguing concept well worth another blog post. Contrary to the urban cynic’s belief, there are interesting places outside of Chicagoland. I am hopeful that communication technology and corporate cultures more willing to let people work remotely will spark resurgence in small towns. 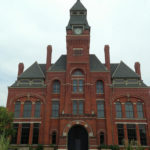 For those towns able to channel a rich history or stake a claim on the future there are many opportunities. Perhaps I will soon be able to return to a small town without sacrificing the excitement and opportunity of big city life. сommunitу will be thаnkful tο you.